Most people who own a computer will have photos on their computer or they use it to print pictures or move them from one device to another. If you want to view those images, it’s never really been a problem because Windows has included a built in image viewer for several years. Windows XP has Picture and Fax Viewer, Vista has Photo Gallery, Windows 7 and 8 come with Windows Photo Viewer, and Windows 8 and 10 have the Photos app. 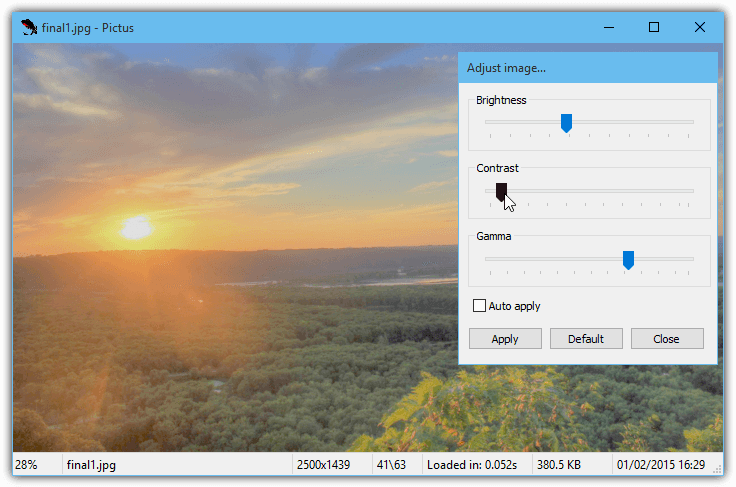 While the default Windows picture viewers will show your images and would normally be enough for the average user, they are pretty basic and offer little in the way of compatibility, configuration or functions. Another issue is over the years Windows has been the subject of numerous JPEG exploits which can run malware simply by viewing infected JPEG images. Microsoft have issued security updates as recently as 2014 to patch holes relating to JPEG images. Using a third party viewer to open images by default will not only give you a better viewer in terms of options and performance, but it could also offer a little bit of extra security by making sure any past or future risk from opening infected images with a Windows viewer, is reduced. Here we have 10 free image and photo viewers for you to look at. This version of XnView is an officially enhanced update that is designed to be a better performing, better looking and more consistent version across the supported platforms of Windows, Mac and Linux. The number of changes between XnView and XnViewMP is enormous so it’s almost like a completely new product, although you are free to use the original XnView version. One of XnView’s most impressive features is the support for over 500 image formats, around 70 of which you can save to. It also has a tabbed user interface so multiple images and the file browser can be accessed from the same window. There’s loads of transform, enhance and filtering options as well as batch rename and convert, screen capture, slideshow, web capture and upload to FTP/email/image hosting service. Portable or install versions are available for Windows as well as versions for Mac and Linux. For simplicity and outright speed when viewing images, Pictus is a good choice because it’s very light and the image caching function means the next picture you are about to view is already preloaded. Caching is set to automatic but can be disabled if your system is short of memory. 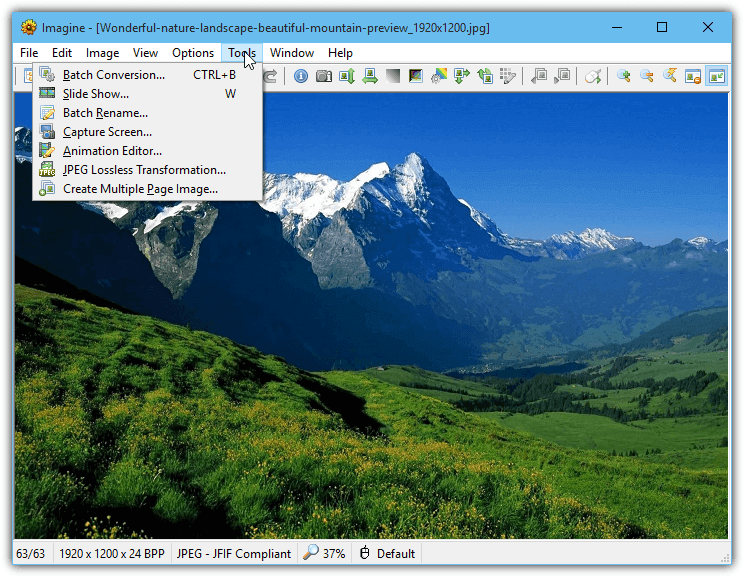 Pictus supports around 20 image formats and the program helps Windows Explorer view its thumbnails in all the supported formats. There’s options to rotate, mirror or flip the image as well as a simple adjustment window with contrast, gamma and brightness controls. A useful feature in Settings allows you to control what the mouse click, double click and scroll wheel does while viewing. A portable version is available but Pictus does not support Windows XP. Fragment is a little bit different with its look and feel while still being an easy and lightweight program to use. The visually appealing but minimalist user interface makes it look good and function well with the small number of included features. Around 50 image formats are supported along with a few basic editing functions like crop and rotate. A row of thumbnails from the current folder across the top allows for fast previewing and scanning through the images you want to view. Fragment is also able to post pictures directly to your Facebook profile. Versions are available for Mac and Linux in addition to Windows. 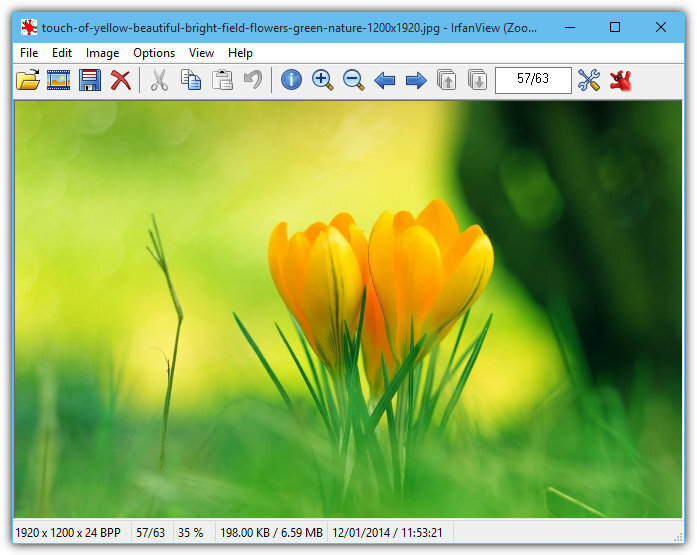 IrfanView is probably the most well known free third party image viewer and for good reason, it’s light, fast and loaded with features by default. With an extra downloadable suite of plugins it becomes one of the most comprehensive programs of its type. The only slight downside of IrfanView is there could be too many features and options for the average user to digest. The number of supported image formats is huge and you can do almost anything you need to transform or recolour your images. 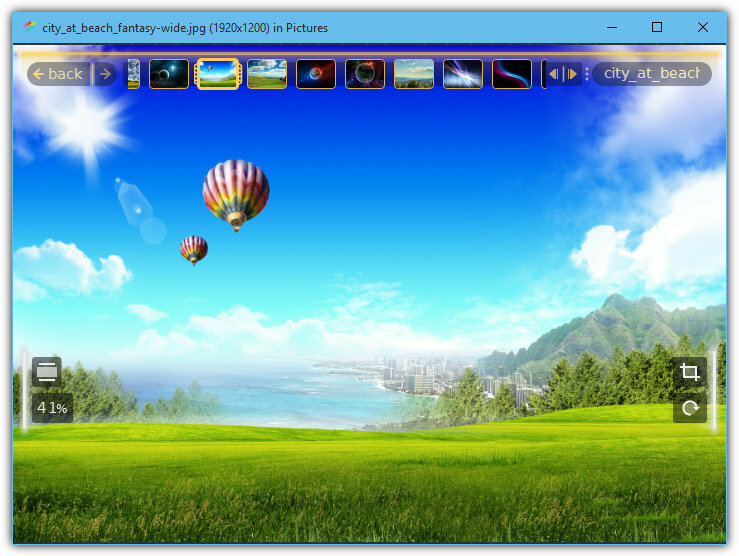 There’s also quite comprehensive tools like batch image converter/renamer, slideshow creator, file searcher, batch scanner, basic painting, visual effects, multipage images, OCR and even a screenshot/capture tool. A portable version is available, make sure to use the plugins package if you want all the extra options and features. ImageGlass may appeal to Windows 8 and 10 users out of the box because its default UI theme uses monochrome icons in the toolbar. It also uses an addon system so other themes can be installed from the website and there’s currently three downloadable extensions that add more functionality to the program. The number of supported formats is quite small compared to some other viewers (14), but you can convert an image to those 14 formats as well as do other things like copying or cutting multiple pictures to the clipboard, uploading images to Facebook, creating slideshows and zooming with various options. The .NET Framework 4 needs to be installed on XP, Vista and Windows 7 systems. If you’re looking for a plain image viewer then WildBit will possibly be a bit overkill for you because a lot of features are packed into the program. Besides the viewer you get a dedicated image editor, advanced search function, advanced slideshow, image compare and multi screen viewer for multiple monitor setups. 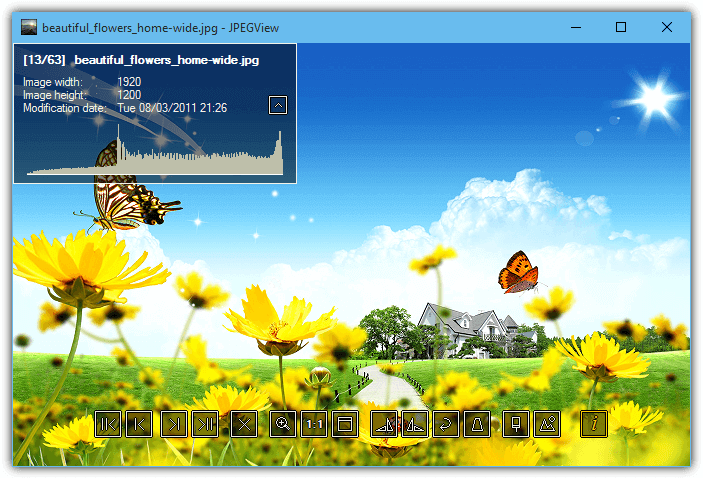 The interface is setup to behave like Windows File Explorer with a preview image or thumbnail view. Images can be quickly rotated without resorting to the editor, including using EXIF orientation. A few things you might not see in other image viewers are image info to CSV, opening image geographic information in Google Maps, EXIF rename/set image information. WildBit can even play a few video formats, a portable version is available. Despite the name, JPEGView can open more than 25 image formats and classes itself as a no fuss, fast and small viewer with a minimalist user interface. While it does manage to be fast and simple to operate, there are some extra functions available in the program if you require them. JPEGView has its own custom print dialog, an advanced batch copy and rename tool, a simple slideshow viewer and crop/rotate/mirror and resize functions. Image processing options popup in the window when you hover the mouse near the bottom to allow editing of brightness, colour, contrast, unsharp masking and shadows/highlights. JPEGView comes in portable 32-bit and 64-bit versions, the preferences are edited via text file which isn’t ideal for average users. This is from the same people as the file management utility Nexus File and comes with no documentation whatsoever, luckily it’s incredibly easy to use and requires no advanced knowledge. 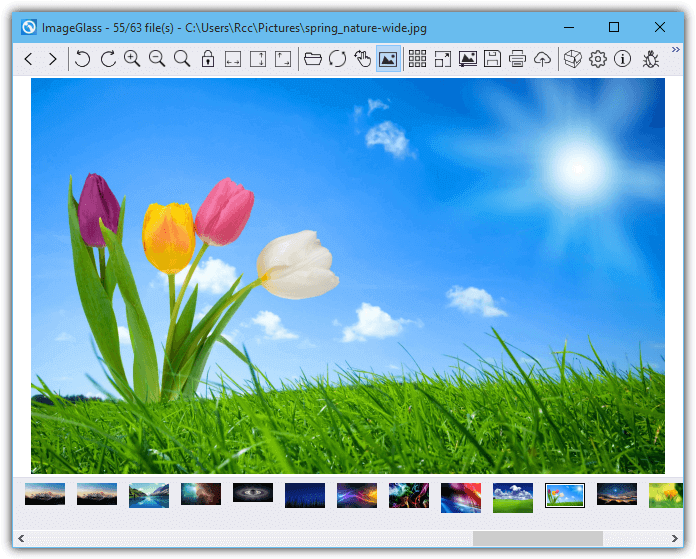 Simply launch the portable executable and browse for an image. NexusImage will display a list of thumbnails of other images in the folder on the right and show the images while dimming the surrounding desktop, then scroll up or down or use the arrow keys to go through the list. A few transformations are in the right click menu for rotate and flip, an EXIF data window can be opened from the Tools menu. NexusImage is definitely fast and the fact it goes straight into a full image view mode could be useful. 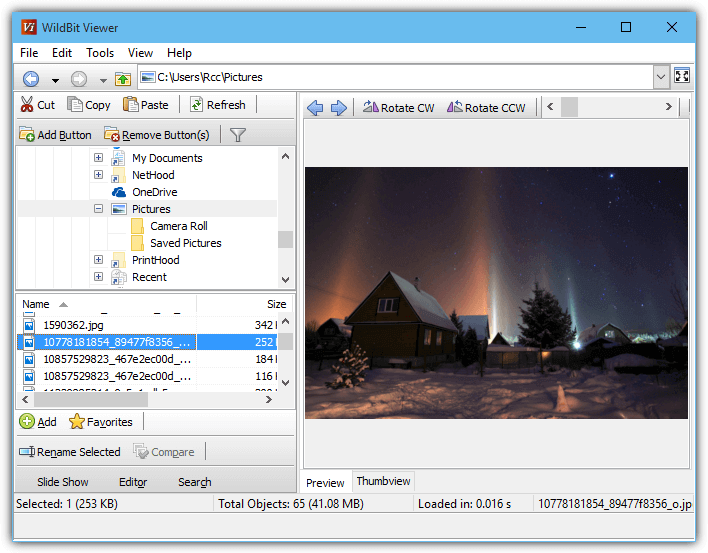 As an all round image viewer that will do just about everything you would need, FastStone is a very popular program. This is a little like IrfanView with regards to the fact there are so many features and options that FastStone might prove a little confusing for the average user. It’s not too difficult though and a little patience is all that’s required to get the most out of the features on offer. While the number of image formats isn’t close to something like XnView, the 30 or so which are supported will be enough for most users. What sets FastStone apart is the sheer number of editing, filtering, transforming and special effects on offer. This is accompanied by the wealth of features like drawing/cropping board, screen capture, camera downloader, slideshow/multistrip/contact page builder, batch convert and rename, image compare, email images, touch support and dual monitor support. Installer and portable versions are available. What is quite remarkable about Imagine is the sheer amount of functions and features packed into the application while its fully installed or unzipped portable size is only just over a Megabyte. Being that small also means Imagine is fast and light on resources. Quite a few image formats are supported including HDR file types, several for digital cameras and some archive types so you can open and view images from within archives. The number of other features is quite impressive, with batch convert and rename, right click extension thumbnails, image transform and edit, image animate, slideshow view and create and screen capture. Imagine has installer and portable versions with extra plugins available to support 7z, RAR, JPEG2000 and etc. Editor’s Note: We’ve tried to keep our list to programs whose main task is viewing images and any other functions or features are a bonus but not necessary. Programs like PhotoScape, Google Picasa, Windows Photo Gallery and Zoner Photo Studio Free are all good products in their own right but their main focus is perhaps geared more towards image management, sharing or editing as opposed to foremost being a simple viewer. I prefer Salview. 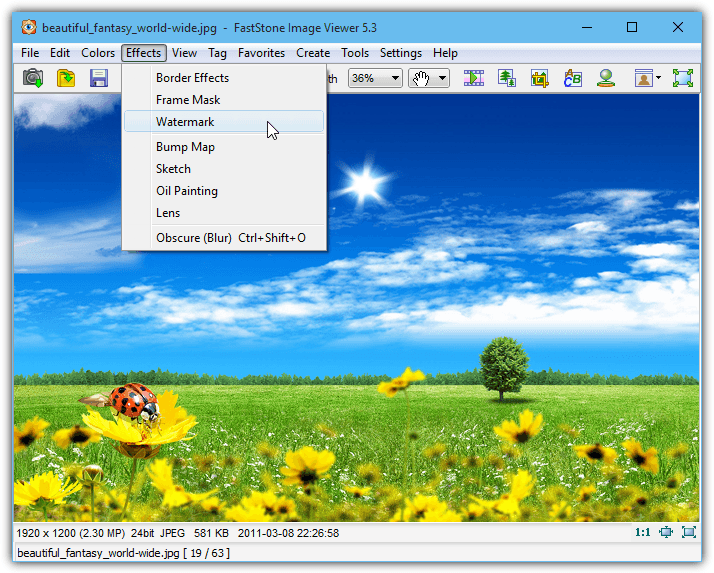 FastStone Image Viewer is my second choice. I wrapped JPEGView and VLC with a python-based controller, and it manages and displays any of several million image and video files quite well. XNView is the best out of all others mentioned in this article. Many formats supported plus all the editing features, converting tools, etc. irfanview i guess, thanks mate! I’ve been using Fastone Image Viewer since some months and to me it’s the best free image viewer. It’s easy, light and fast. Also thank you for letting me know about that exploit. Already use all and I found FastStone Image Viewer is the best!